The movement of muscle fibres in response to force or load. • Concentric—The muscle shortens in length as it overcomes resistance. • Eccentric—The muscle increases in length to accommodate resistance. • Isometric—The muscle resists outside stress without exhibiting motion. Types of skeletal muscle contraction. the process of force-generation in the fibres of any class of muscle, by the interaction of myosin head-groups in the thick filaments with actin molecules in one of the immediately neighbouring thin filaments. This is set in train ('activated') by a rise in the concentration of calcium ions [Ca2+] in the muscle fibre cytoplasm in all types of muscle, but the mechanism for this rise differs in important respects between them. 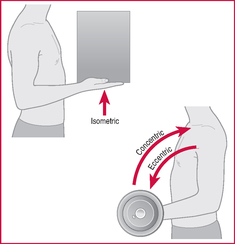 With reference to skeletal muscle, 'contraction', though literally implying shortening, is used to describe force-generation, whether it actually results in shortening (concentric action), tension without movement (isometric action) or even lengthening against the muscle's own resistance (eccentric action); the last is sometimes called an 'eccentric contraction' or, even worse, a 'lengthening contraction' - paradoxical usages better avoided. See also excitation-contraction coupling, force-velocity relationship, myofibrils.